Technical Evaluation: After scientific approval, each application will receive a technical evaluation by the research centre to assess technical feasibility, safety and scheduling. If a selected platform is unable to accommodate the project, the proposer will have the opportunity to select an alternative (if it is available within Instruct). Track Progress of applications: All information about your proposals and visits is displayed within your dashboard, from where you can track the progress of your visit. Communication with Centres: You will be notified by email for all communications relating to your visit. Please sure your ARIA account is updated with an email address which you check regularly. Edit profile. Visit date: Contact the centre to discuss dates, using the contact button within your dashboard for your proposal. Plan your visit: Each centre page has information about location and travel and a contact person. 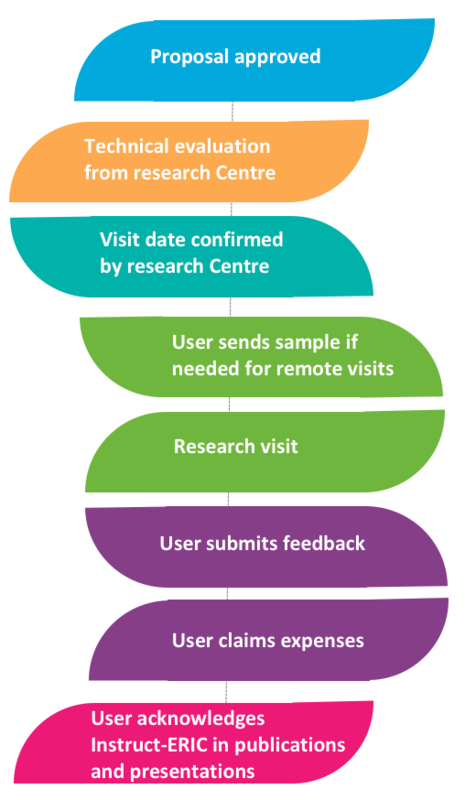 Consult Access Costs and Funding, and check the visit costs upfront with the centre you are due to visit. Reimbursement: Users should book and pay for their own travel and accommodation for access visits, which will be reimbursed up to the maximum value allowed, at the end of the visit once you have submitted feedback. Fill in the reimbursement form, and post with receipts to Instruct-ERIC (Oxford House, Parkway Court, John Smith Drive, OX4 2JY). Acknowledge Instruct: In agreeing to Instruct terms and conditions, you agree to acknowledge Instruct-ERIC in scientific publications and presentations arising from your research visit. In published material, please acknowledge the use of Instruct infrastructure, expertise and resource contributions using the following text: " The authors acknowledge the support and the use of resources of Instruct-ERIC." For slide presentations, a selection of template slides is available in the online dissemination resources area. The Instruct-ERIC logo should appear in the footer of slides presenting data obtained with support from Instruct.